Wow, what a day Saturday, May 11th is! Not only the Virtual Vegan Potluck but Charlotte’s Second Annual Vegfest! I am SOO excited!!! Thanks for stopping by to sample my Indian fusion dish. No, it’s not Indo-Chinese fusion – it’s a fusion of North India and the American South! I’ve had a couple of food obsessions the past few years. One, learning to cook traditional North Indian food. Two, veganizing all the comfort foods of the American South I grew up on. So I guess it’s no surprise my latest obsession is “Indian Fusion.” Combining elements from the American South foods I grew up on with the North Indian/Punjabi flavors both my partner and I love. It’s always amazed me how we grew up on such different parts of the earth and yet there are so many similarities in the foods we ate growing up. Growing up in the American South – Charlotte, NC to be precise, as you may have guessed from the title of my blog – a typical menu was a pot o’ beans and a mess o’ greens. On the other side of the world, in Goraya, my partner was also eating beans and greens. Maybe the bean part isn’t that surprising. Indian food celebrates a wide variety of almost every kind of bean and lentil imaginable. However, I had a faulty image that Indian greens were always “just” spinach. Turns out all kinds of greens are used for saag in India – including collards, kale, turnip greens, and mustard greens! 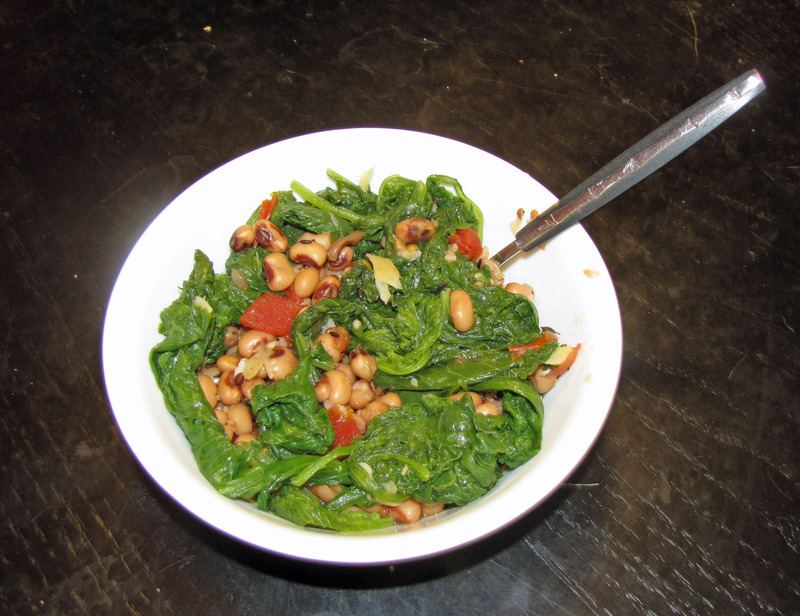 One of my favorite meals growing up was a pot of black eyed peas and mustard greens. What if I gave it a slightly Indian twist? To do this, I’d use black eyed peas – a bean my partner swears he never ate in India. I’d keep the Southern seasonings of lots of garlic, jalapeno pepper, and tomatoes, but add some cumin seeds and garam masala. As far as the greens went, my plan was to use mustard greens and season them with ginger – a typically Indian spice – but instead of cooking them in a pressure cooker and blending them into a paste, I’d leave them whole and saute until just wilted. Heat the olive oil in a 2-quart saucepan. Add the cumin seeds and gently stir until they start to sizzle and “pop” – about 30 seconds. You want them slightly browned, not burnt. Add the garlic and jalapeno pepper. (Jalapenos are traditional American South; for a more traditional Indian version, use 2 diced green chilies). Cook for about two minutes. Add both the Roma and canned tomatoes. (It’s important to use both, the canned tomatoes make it saucy but the Roma tomato gives it freshness.) Add the Garam Masala and salt. Simmer about 5 minutes or so. Add the black eyed peas. (If using canned, drain and rinse the beans first.) Add the water. Bring to a boil, then reduce heat and let simmer 15 minutes. Heat the olive oil up in a large skillet and add the ginger. Stir-fry for 3-4 minutes. Reduce to medium heat. Add the greens, as much as the skillet will hold. Stir gently and place the lid on the skillet. The greens will start wilting; when they do, remove the lid and add more greens. Stir, turning the greens over so the wilted greens are on top. Replace the lid. Repeat until all the greens are wilted. Sprinkle with salt and stir. 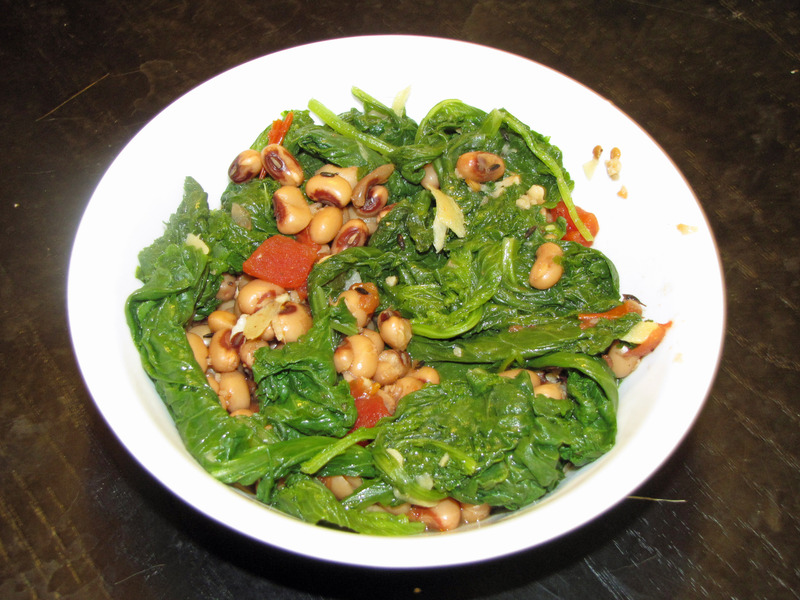 Line a bowl with the greens and ladle the black eyed peas on top. Stir. Eat. Enjoy. Note: If you’re planning on leftovers, cook only half the greens, and cook the other half when you reheat the beans. The greens taste better fresh. Did you have the chance to sample the dish before mine – Blue Eyed Bookworm’s Lemon Garlic Scallops? And you don’t want to miss the next potluck dish coming up … a raw yellow beet ravioli … from one of my favorite bloggers … Eat Live Burp. Thanks for sharing! I will have to experience more recipes with black eyed peas someday! That looks tasty! Thanks, Rika! Black eyed peas are a kind of comfort dish for me! This looks really delicious! I love fusion. Can’t wait to try this. Thanks! I love fusion dishes too. Garam Masala makes everything taste amazing! Doesn’t it though? It’s also really good in sweet potato soup. Yes, try it in sweet potato soup with green chilies! It’s awesome! Ooh I will, love the sound of that yum! What a delicious combination of flavors! Thank you very much for joining the Potluck! Thank you! This is my second Potluck and it’s been amazing! What a yummy creative fusion dish! Happy VVP! Have you posted your sundal recipe yet? I’d love to try it! Amrik claims he never ate black eyed peas growing up; yet I’ve seen black eyed peas in the Indian grocery. Perhaps they are more frequently used in South Indian cooking than North Indian? It’s very common in south India especially during “navrathri” where a different “sundal” is made on each of the 9 days of the festival. I have a garbanzo sundal recipe on the blog, black eyed peas can be used instead of garbanzo. Yummy, spicy and comforting! Fun to see you here Charlotte! Don’t worry about it, Somer! A lot of people (outside the American South) make the same assumption. I’ve changed the url to my blog to http://www.vegcharlottenc.com and may change the name to VegCharlotteNC to keep it clearer! Oh, btw, voted for your Mango Sticky Rice Cake … or Sticky Mango Rice Cake … or Cakey Mango Sticky Rice … whatever it was, it had my vote! Yay for fusion food. This looks really good. Thank you for the recipe. I really like recipes that are so easy to follow with basic ingredients that you can get all over the world. Thanks! Oh, my goodness. I grew up with onions, garlic, and sometimes hot peppers in greens but using ginger instead is absolutely amazing!!! It has to be fresh ginger; this is one instance where the ginger paste won’t wok. And here’s a tip, from a gal who grew up eating black eyed peas … Garlic. Long as you have lots and lots of garlic, it’s good. Chickpeas would work really well in this recipe!